I'm always on the hunt for a great piece of furniture to makeover. I've mentioned before that I'm constantly searching Craigslist looking for something special. A few weeks ago I was lucky and found a wonderful dresser that I had to have. I sent the Hubby to pick it up and while he was out he texted me to tell me it was a great piece. That's how you know it's good, when the Hubby says it is! When I buy a piece of furniture I look at it for a bit and think about what I want to do. I try very hard not get in a rut and do the same thing with each piece. 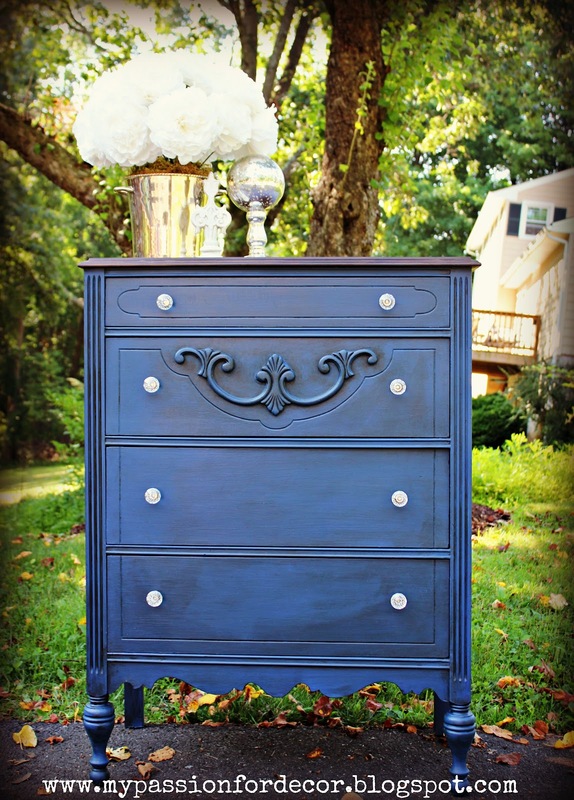 With this piece I knew it needed to be a bit different and I had the perfect paint leftover from Hunter's dresser to make this happen. 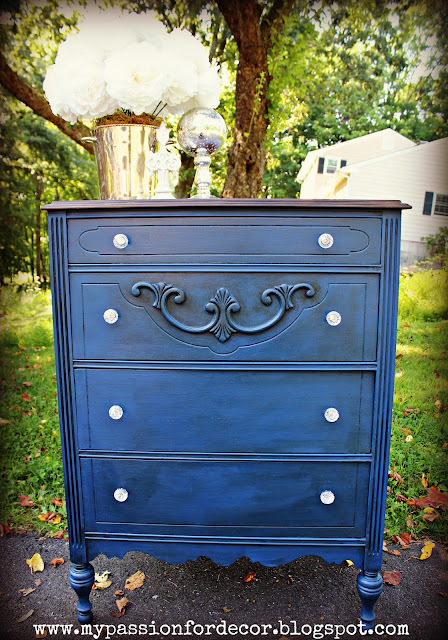 For some reason this dresser was saying "Paint me navy blue!" Here's what the dresser looked like before. The dresser was light blue, high gloss paint with flower ceramic hardware. It wasn't terrible the way it was, but I'm not a fan of semi-gloss paint on a piece like this. 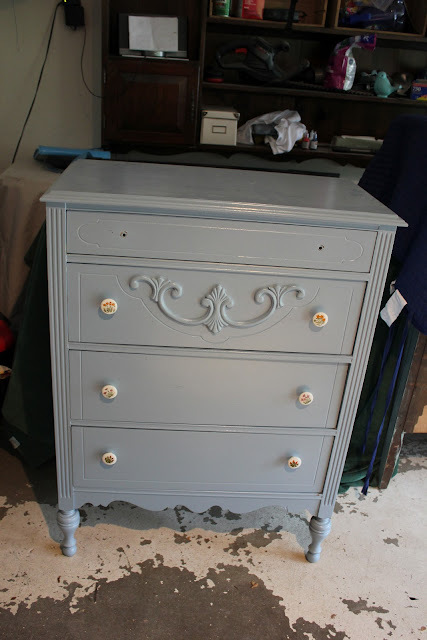 The rest of the dresser I painted in Annie Sloan Napoleonic Blue. It's a navy blue, but with a bit more royal blue hues in the paint. I love this color. It's so classic, timeless and rich looking. I didn't take a lot of progress pictures and I have no idea why! This project wasn't as challenging as the last few so I just went along and enjoyed each step this time instead of stressing about what was going wrong. 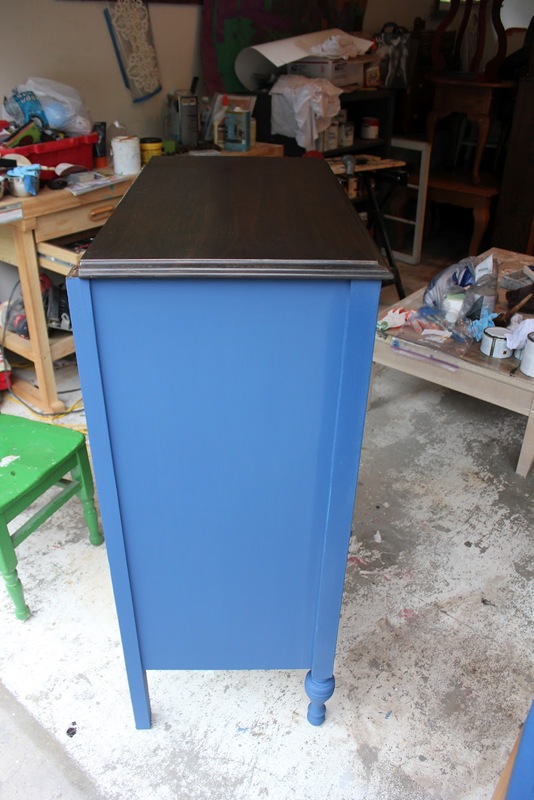 I love the Napoleonic Blue with the dark wax on top. It adds such richness and depth. Here you can see the difference between the drawers. The top drawer has clear wax with dark on top and the bottom just has clear wax. The difference is huge, no? I put on some new hardware as well (you can't see it in this picture obviously!) because the ceramic flower knobs weren't working for me. I went with clear faceted knobs that pop off the dark, navy blue. I know I write this a lot, but I really love this one and think it's my favorite. I love the depth, character and details of this piece. 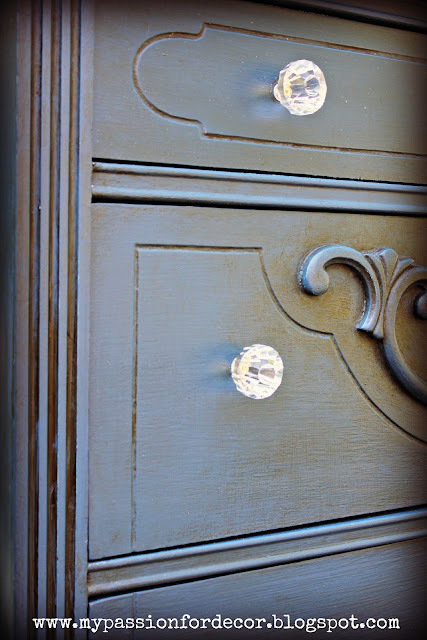 Plus the knobs on this paint color!! LOVE THEM! I like the combination of the dark stain with the rich, blue paint. I love how the dark wax stays in the grooves and helps to show them off. This detail is my favorite part of this piece. I've spent a lot of time staring at this piece and admiring the beauty of the legs, the curves and the embellishments on this piece of furniture. After doing a few challenging pieces it was nice to really enjoy the process again and have a piece that worked with me and not against me. I'm starting to think I need a big warehouse to store all the pieces I really love and keep them all! Unfortunately I know the Hubby won't agree to that so for now I have to find this one a new home. 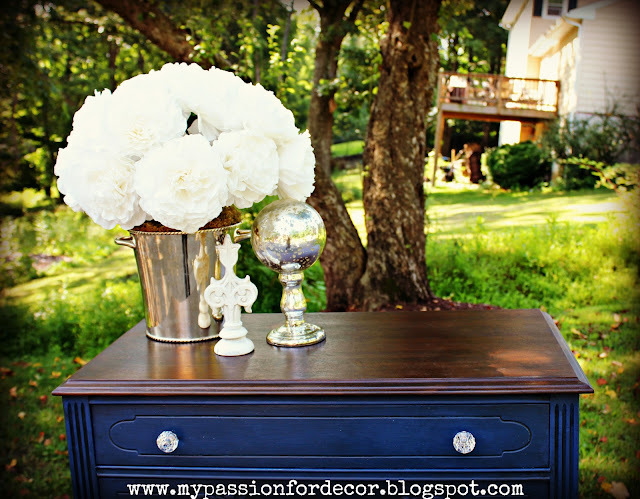 I hope you like this dresser as much as I do! Let me know what you think. I enjoy your comments and questions so keep them coming. 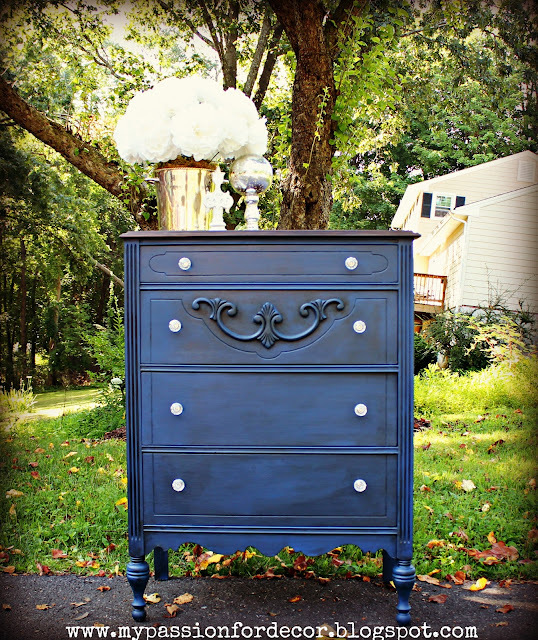 Have a great day and thank you for taking the time to read about my furniture adventure!! I get in moods moods like that too for a certain color! I am in a blue mood right now as a matter of fact. 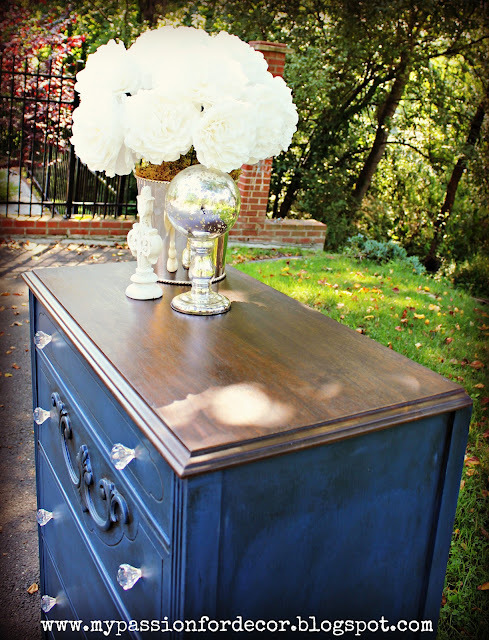 This dresser is darling! Love it! WOW! what a difference i really love that blue! I love your work. Tell me about the clear was and the dark? Where do I get it? I get the wax from www.bestfurniturpaint.com Patty and Karen are the best! Let me know if you have any other questions about the wax specifically. Absolutely love it Melody!! I agree with you 100% about staining the top and painting the rest of the dresser! Awesome job, as usual! I also agree with staining the top. It looks much richer. I really love that blue and I'm really loving the stained top with it. Melody - it's stunning - what a great job! 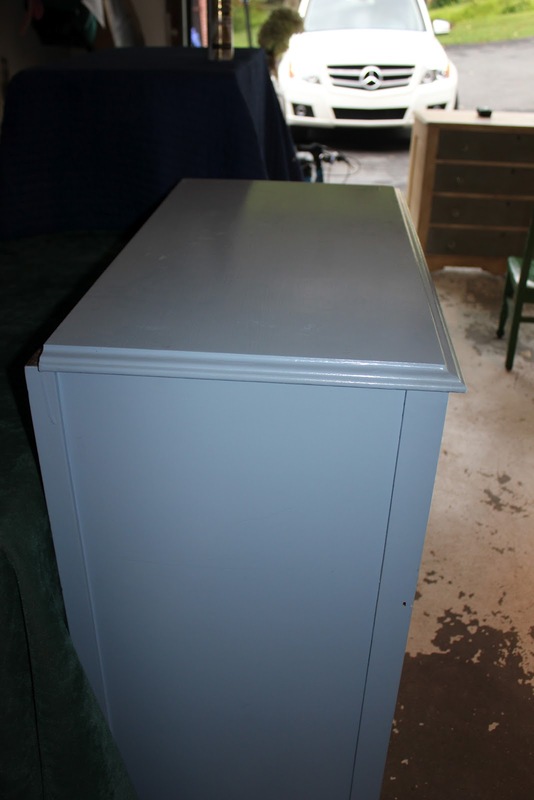 Love your work and have officially started stalking you on Craigslist, however I'm looking for a small white bureau to use as a night stand in my very demanding daughter's room. I sent you an email and my number. Can't wait to hear from you. Melody, The piece IS great......GREAT MAKEOVER. And, I love the stained top with the blue paint. My theory is "if you find something that works, keep doin it." I've enjoyed browsing your blog, so now Im following. Please take a minute to come visit me and maybe you'll decide to follow back. that is gorgeous!!! love that rich color and those knobs against it! The blue is amazing on it and the details are elegant. Really like what you did to make it over. Beautiful work, the blue is what caught my eye. I love the bold color on such a dated piece it makes it pop, ya know old with bold. Hey that rhymes. Anyway I saw you off the Thrifty Tuesday at Coastal Charm. I'm your newest follower. Come check me out as I'm a newbie and need all the support and inspiration I can get. You are not in any rut! 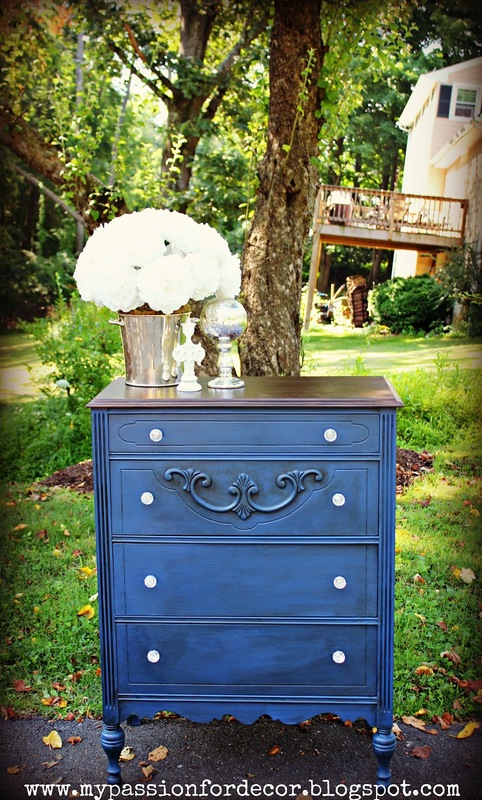 As a new furniture painter, I have come to your blog for many beautiful ideas! Your before and after photos and your explanations on each piece are some of the many things I enjoy when I read your blog. Keep up the great work and many blessings to you! Gorgeous...as usual! :) I totally agree with you about the stained top. My thought is, if the top is in good enough condition to stain, then I'm staining it! I feel like I owe it to the piece! ;) Can't wait to see what's next! You find some of the most beautiful boned pieces and I love where you take them. Thanks so much for sharing another "Passion Creation" on BeColorful. I always enjoy seeing what you have done lately. Very pretty. 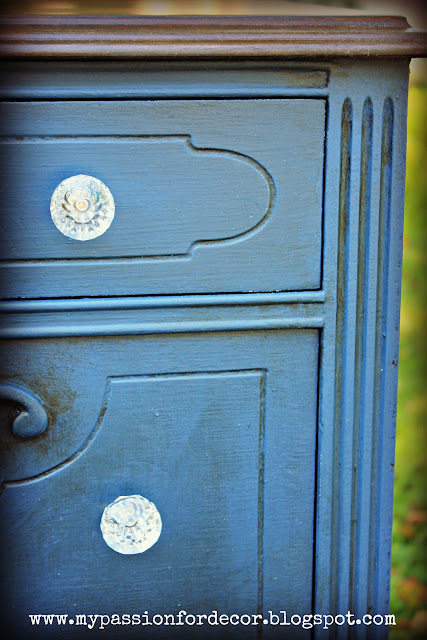 I love vintage dressers. Thanks for linking this to Hot Fun in the Summertime. 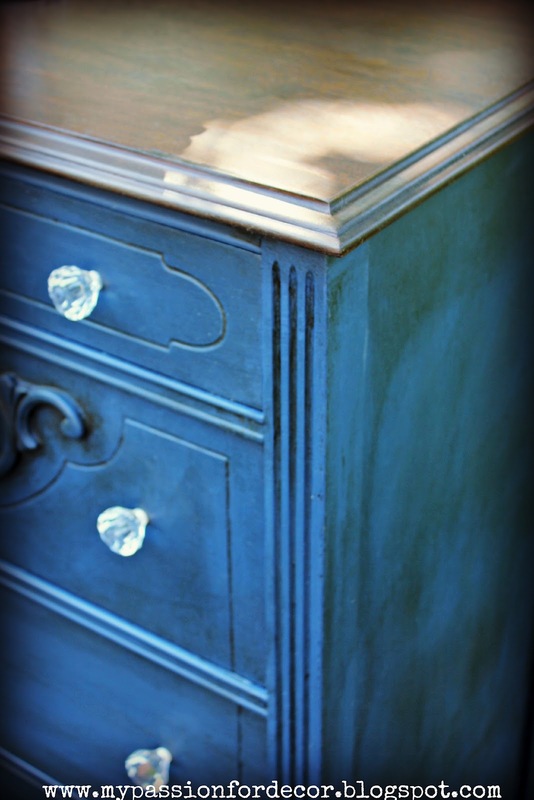 I agree, the combination of the blue with the rich wood top is gorgeous! if that's a rut, I think I'd stick with it! Really great job! Love that blue...VERY French! Thanks for joining our party! It is beautiful and all the details just make the piece all the more beautiful! I also like the two tone look, natural wood on top and paint. this is typically how I finish most of my pieces. I think the natural tops give the piece a more elegant feel to it, and feel the top is more durable! I am a lover of wood though! So glad you shared your creative inspiration with Sunday’s Best – your creativity helped make the party a success! Congrats on your feature on Handy Man, Crafty Woman! This is just too gorgeous!! I love that color and never would have thought to use it! Thanks so much for sharing at my Throwback Thursday party. I hope to see you again this week! Oh I LOVE this!! I hope you'll stop by on Friday's to link up to our link party Frugalicious Friday!! Stunning piece! Great job. I'm following. Congratulations! 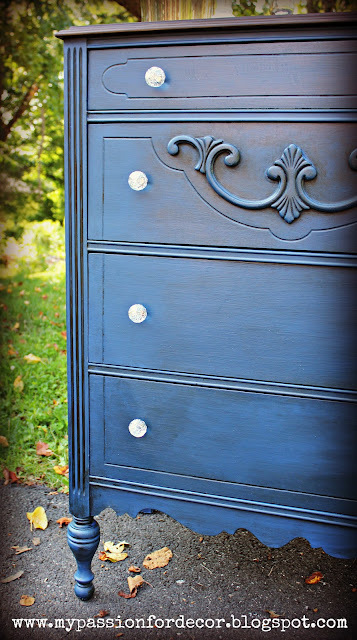 You have been featured on Handyman, Crafty Woman's Wicked Awesome Wednesday! Feel free to drop by the website and pick up your button! This is just beautiful! I love the color! Great color. Can't go wrong with navy. 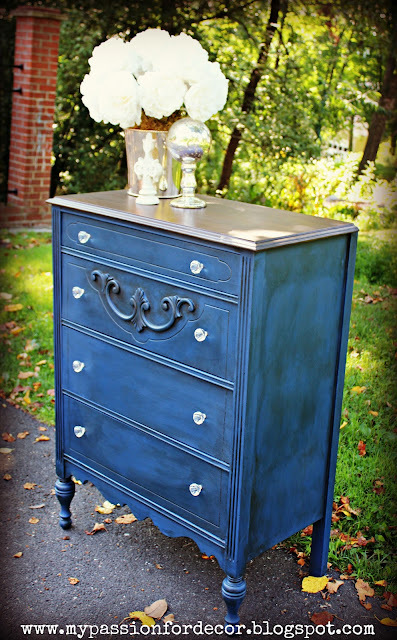 What a pretty dresser! I love the wood top with the navy. Great job. This piece is beautiful! I love the navy blue with the stained top. I have a question for you. When you stain the top do you finish it with the wax as well or use a varathan? Thank you!!! I have used polycryllic on a dresser and 2 nightstands, but after that I switched to the wax. It's durable, and looks nicer in my opinion. My kitchen table, coffee table, media cabinet, end tables are all done with just wax (several coats) and I have a 7 year old boy. It stands up to him driving cars and doing his homework on the table tops. Hi Melody! I think this piece might be my favorite of yours, quite stunning. Quick question, did you distress it at any point or does adding the dark wax on top of blue give it the color variation and depth? Thanks! Thank you! I did distress the dresser a bit, but the dark wax does give the piece a bit more character for sure. It adds a lot of depth and color variation. I see this post is rather old, but I have a questions none the less. This dresser is beautiful. 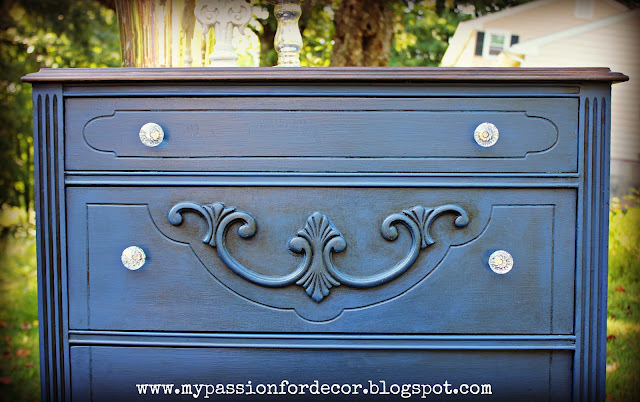 Did you have to sand off the paint of the old dresser before you repainted? Did you use a navy blue wood stain or paint? Is the wax what gives it a darker color? Hey, I know this is from last year, but I am showing it off on my blog tonight! 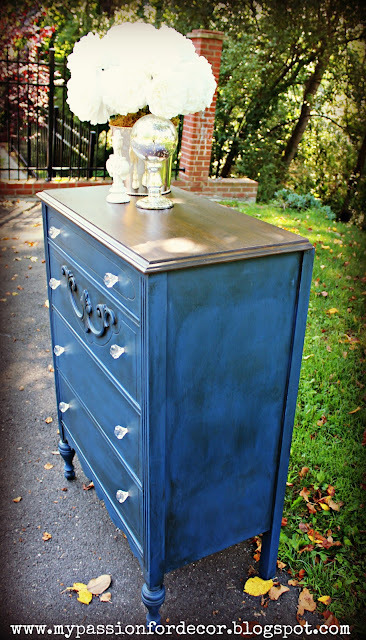 Love this....I have a trunk that I just may use this color!! Thank you Sharon! This is one of my all-time favorite pieces!! And the color....love! You did an amazing job on this beautiful chest!